Three days of workshop, symposium, two special blocks for young researchers and also two performances were comprised into the Gogol in Cluj/Cardiff event between 21-23 March. 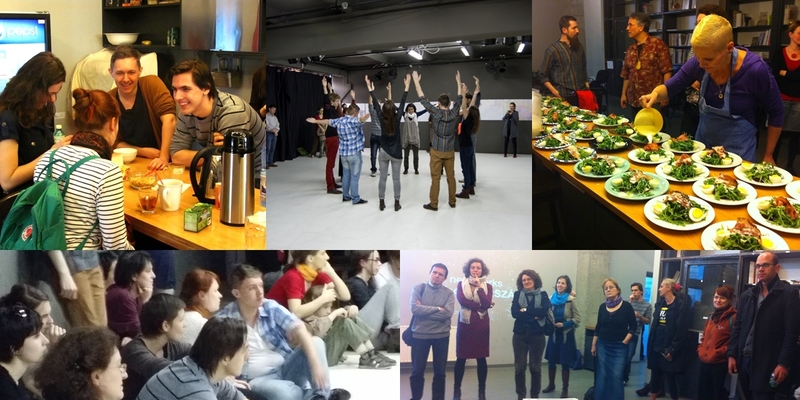 The first international, practice-based research oriented event of the Representations of the Other project has come to life as an interwoven endeavour of the Gogol InterPlayground project – a rhizomatic, world-wide growing network that encourages the use of drama as a tool for social transformation –, the GroundFloor Group from Cluj (Romania), producer of cutting-edge performances in the Paintbrush Factory, this latter serving as a venue for this event as well. Organization and professional support was also assumed by editors and contributors to the Játéktér/Playing Area theatre periodical. Writer and university lecturer Ian Staples and his team of students in theatre held rehearsals at the University of South Wales, Cardiff on the Gogol workshop from late February. Starting from socially sensitive ideas that emerge from The Government Inspector, this time the Gogol-interpretation focussed on the methods and ways by which power is nurtured by fear, tackling with special cases raised by minority issues. During the three intensive days of March in Cluj, the topic of oppression and corruption was dealt with under the guidance of David Buchbinder and Roula Said from Toronto, founders of Diasporic Genius. Csongor Köllő, actor and teacher of acting also took part at the workshop, leading certain sequences. Workshop attendees were mostly students of Theatre Studies and young critics, as the conception of the Cluj workshop was also to transgress the borders between theory and practice in theatre, and provide young theoreticians a hands-on experience on theatre. On the last day of the Cluj event the workshop opened up for the symposium attendees and wider public and presented and invited them for participation in a series of playful acting exercises – a short introduction into community-building actions. A Forum-theatre event led by Lilla Proics (Budapest) closed the evening: an introduction to participatory culture to the audience, this time raising the question: Should theatre professionals be involved in cultural policy making? Researchers and theatre professionals met at the symposium section of the event to share the outcome of their work, especially regarding themes of otherness represented through and in performing arts. Two special blocks were consecrated to young researchers in theatre studies, preparing their doctoral thesis: their presentations being followed by discussions. Doctoral researchers who presented: Éva Bonczidai (The Reception of Miklós Bánffy’s Plays in Hungary and Transylvania), Kinga Boros (Uneasy Theatre), Yvette Jankó-Szép (On the Translation of Contemporary Finnish Text Written to the Stage), Csongor Köllő (The Physical and Vocal Training of the Actor), Emőke Pál (Artistic Genres in Actor’s Training), Csaba Szilágyi-Palkó (Taboos and Bodies – Gender Roles and Stage Roles), Anikó Varga (How Many Spaces: an Approach Towards Péter Halász’s Performativity), Andrea Zsigmond (A Semantic Approach to Theatrical Discourses). Äse Eliason Bjurström (University West in Trollhättan, Sweden) introduced the Gogol InterplayGround project, drama as a tool for learning and social transformation, applied theatre, followed by a round-table discussion on the issues. Sándor Sajó (Eötvös Loránd University, Budapest, Department of Aesthetics), Attila Szigeti and Imre Ungvári-Zrínyi (Babes-Bolyai University, Cluj, Department of Philosophy) led round-table discussions on otherness and performativity dealing with theoretical aspects of the issues. Throughout the three-day event is Cluj the attendees were invited to the recently UNITER award-winning performance Parallel produced by GroundFloor Group, followed by a discussion led by Anikó Varga (Játéktér/Playing Area), also to the Uncle Vania at the Hungarian State Theatre in Cluj, they attended skype-session with the Cardiff-group and with Morten Nielsen about Through Different Eyes – a project of Global Stories from Denmark. Special winter issue of the otherness.dk: Otherness and the Performing Arts: Call for Papers is coming soon. Further plans: yearly workshops on theory and theatrical experience of Otherness; a selection of essays on Otherness translated into Hungarian.